My mom always drilled into my sisters and I just how important brushing your teeth is. Even to this very day, she still talks to me about making sure I brush my teeth in the morning and before bed. I am 32 years old, but she is still my mom and wants the best for me. Have I always followed my mom’s advice? Not always- sorry Mom! I do religiously brush my teeth in the morning and will not leave the house without doing it. I hate the gross feeling and taste after I have been sleeping and like feeling fresh. Plus, I have been told by John (and my ex-husband, Kris) that I have horrid morning breath. Think “dragon breath”. Not so pleasant right? To spare myself the humiliation and to save others from being disgusted, I ALWAYS brush my teeth every SINGLE day! At night time is another story. I often will fall asleep or get too comfortable and then forget to brush them at night. I always enforce to my kids to brush their teeth morning and night and SHOULD be listening to my own advice, but I don’t. I’ve been lucky so far with my teeth. I had four small cavities after I gave birth to Olivia 12 years ago. Since then I have had no problems. I was seeing a dentist every nine months for a check-up and cleaning. I had coverage through my ex-husband’s dental plan. Now that I am going through a divorce, I haven’t seen a dentist in over a year. I simply cannot afford to go right now for a cleaning. The only minor concern I have right now is a chipped bottom tooth. I have the nasty habit of biting my nails and I think I chipped my tooth biting one!! Maybe my teeth aren’t as strong anymore? I don’t know but it’s very annoying and feels weird. It’s small and not very noticeable thankfully. 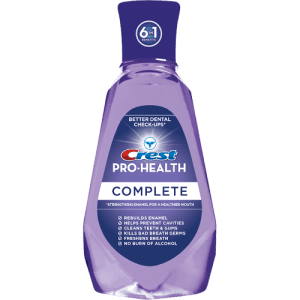 I was selected to participated in the Crest Pro-Health Complete Rinse Test Drive Program and try out Crest Pro-Health Complete Rinse! I am excited to see what my experience is and if it is easy for me to add into my daily routine. Stay tuned for my progress and I will let you all know how I am making out. Will it make a dent on my Dragon breath? I hope so!! I wrote this review while participating in a test drive campaign by Mom Central on behalf of Crest and received a sample to facilitate my candid review. Mom Central sent me a gift card to thank me for taking the time to participate.